I don’t have a name for her yet, but a new character I am working on is starting to grow on me. Must be Timeout for Art Thursday. 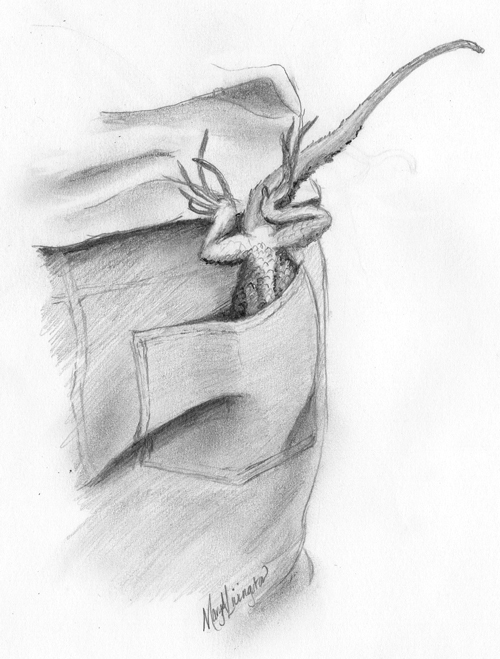 This entry was posted in Art, Bliss Tips, Illustrations and tagged lizard, Mary A Livingston, pencil, Timeout for Art, tomboy by MaryALivingston. Bookmark the permalink. Your lizard seems a bit impertinent. If you’re naming the lizard… Cheeky or Sassy. If you’re naming the tomboy, I like Lily for a tomboy, but she’d hate it and wants to be called “Bug” or “Liz” for her lizard friends, or Sam (Samantha). How fun. Good luck. Lizard does look he’s going to have a bit of a hard time head first in Tomboy’s pocket. Great sketch with lots of personality with one cheeky composition. Yep, rough day for the lizard. What a delightful sketch! This feels like the middle of an adventure. Thanks! She is definitely on an adventure. Missy sounds like a keeper! I won’t relay what The Forester Artist Said. 😛 You’ll have to check in next Tuesday, The Forester Artist and I will be blogging about some of our early encounters in celebration of our 30th anniversary. sorry, frog was supposed to be lizard 🙂 Happy early 30th!